This article originally appeared in the August 2014 issue of Royal Oaks Living and it is reprinted here with permission. Sauvignon Blanc is an aromatic, versatile white grape that’s grown around the world. It’s famous in France for its use in the mineral rich wines of Sancerre and Pouilly-Fumé, as well as white Bordeaux in which it’s often blended with Semillon. New world wine regions have embraced the varietal, too. In California, it’s made into a range of wines and often labeled Fume Blanc to signify the presence of oak. It is also popular in South Africa and Chile. 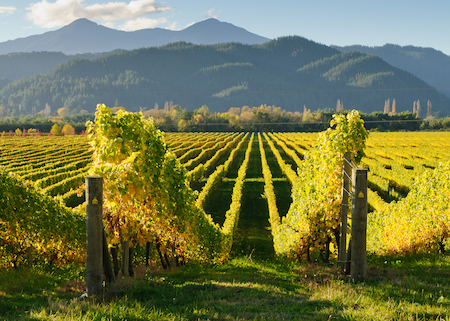 However, for many sommeliers and wine drinkers, the best expression of Sauvignon Blanc comes from New Zealand.